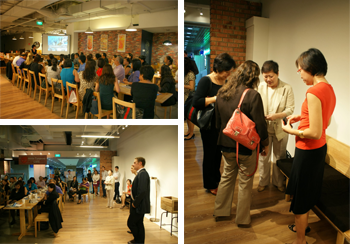 Last week, on the 31st October, ACTIVE Network organised an inaugural Breakfast Event Technology Seminar dedicated to Professional Conference Organisers and Event Planners in Singapore. ACTIVE Network partnered with SACEOS, the Singapore Association of Convention and Exhibition Organisers and Suppliers for this event. The early morning start certainly didn’t discourage guests from attending and the event kicked off with a full house of representatives from leading Singaporean Professional Conference Organisers (PCOs), corporate event planners and event agencies. Guests had time to do some networking while tucking into a delicious dim sum breakfast. The first seminar speaker was Ms. Mei-Sin Yeow, Director, Marketing Communications SACEOS. Mei-Sin gave a warm introduction and spoke about the growing partnership between ACTIVE Network and SACEOS. The second speaker was Mr. Sam Renouf, VP, Emerging Markets / GM, Asia Pacific who introduced The ACTIVE Network and spoke about the main challenges facing event organisers based on the results of the Event Marketing Institute study into Event Technology Trends (2012). The practical seminar component was led by Brian Bergey, Manager, Client Services Asia Pacific, who showcased ACTIVE Network’s newly revamped RegOnline platform. Brian took seminar attendees through the typical event planner cycle, from building the online registration form, to using the reporting function to doing on-site check in. After Brian’s engaging product demonstration, the floor was opened to questions from the audience. A number of interesting discussion points were raised by the audience including questions around registration form access, payment gateways, mobile compatibility and how the RegOnline form looks on a user’s website. Ms Janet Tan-Collis, President of SACEOS also raised some important questions about how event technology can be best adopted by event planners in Singapore. The RegOnline demonstration and Q&A session were well received by all who attended. We are looking forward to organising future event technology seminars to continue to support the Meetings, incentives, conferencing and exhibitions industry in Singapore! SACEOS is delighted to see many of our members at the Event Technology Breakfast Seminar at White Tangerine. We are convinced that you will enjoy using RegOnline as much as SACEOS Secretariat has. Since October, we have migrated all our event registration to RegOnline, and have been enjoying tremendous support from ACTIVE Network. Those of you who have registered for any of SACEOS' events, would have experienced how fast and easy RegOnline is.